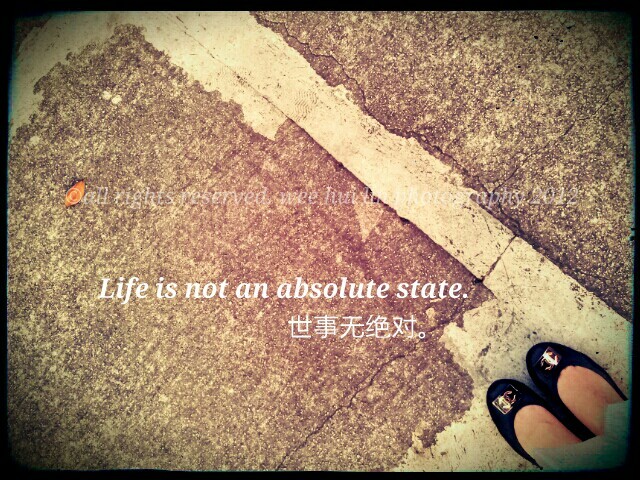 I suddenly realised that there is no absolute in life, as I stared at the concrete pavement yesterday. There is no absolute black and white – this pavement that I stood on seemed to be clearly demarcated in white vs black. But this impression is just formed by a much higher percentage of seemingly black stone particles vs seemingly white stone particles. Upon closer inspection, you will see that each stone particle is not in one pure colour. And in fact, the white stone particles were there because a layer of white paint was painted over it. This is the same as the truths we hear, isn’t it? There is not one single (pure) truth, religion aside., The truths we hear are just made up of many seemingly true accounts. Some have been painted white by the authorities to reinforce its purity but as time passes and the paint fades, some grey appears… And perhaps then we will know the different side of the truth. But this is just me saying…. Anyway, something worth thinking about when you feel crushed by truths vs fallacies?